All of this is to say: Spartacus Ryan Zander and the Secrets of the Incredible is finally out in the world! The book’s big birthday party was on Friday, Aug. 3 and I’m over the moon about the turn out and how GOSH DARN fun the whole thing was! But this was more than a book reading. Mel was also kind enough to do some Q&A afterwards. (The secret to contortion? Surprise! It’s practice.) Also, she shared that she doesn’t prank people by, say, falling over backwards from the waist at dinner parties to surprise people–unless they ask her to. I can imagine that happens a lot. One of the best parts of the night–besides seeing all my friends and signing books and giving kids fake tattoos and sugar in the form of endless donuts (Doe Donuts, VooDoo, and Back to Eden were all represented! WOOT! )–was that our raffle raised $94 for protecting endangered lemurs. I’m blown away by everyone’s generosity. You might be wondering—why raise money for lemurs? 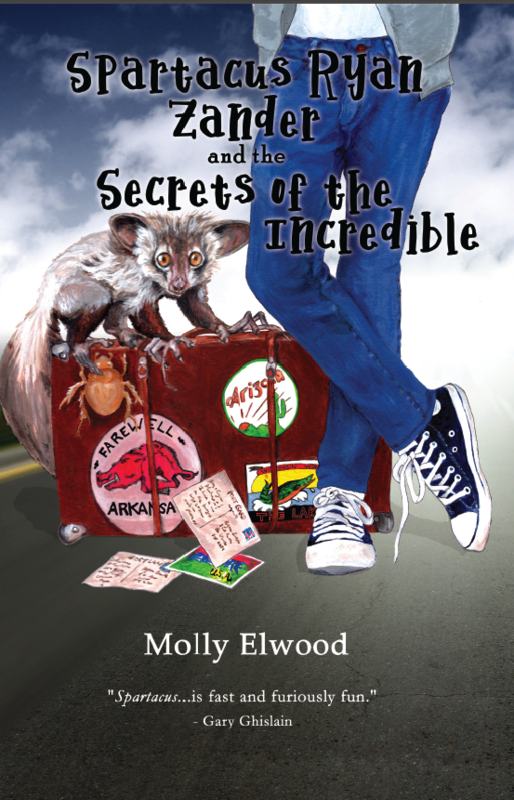 Well, the book has an endangered aye-aye in it named Matilda. I fell in love while researching this wonderfully strange looking lemur and wanted to help. In addition to the raffle, my publisher and I donated 20% of all book pre-orders to a nonprofit dedicated to aye-aye conservation. While it may sound like a pat on the back (though it’s a HUGE thank you to Fitzroy Books!) it’s actually an invitation to explore the world of lemurs and see how you can help. Learn more. This post is kind of petering out, but it’s mostly because while I’ve been assembling photos, my amazing hubs created a video of the event, making the rest of my post kind of moot. You can watch it below. HOWEVER! I can’t end this without giving a shout out everyone who made it out to the signing. I said it there, but let me say it again: It means so much to have you there. There are no books without readers. There are no book launches without friends. There are no kids reading books without adults taking them to the library, so take them there. And biggest thank you of all to Jaynie and Ruth from Fitzroy Books. You both made this into a wonderful adventure–and made Spartacus’s journey so much fun to read. I can’t wait to see where the road leads us. I’ve decided my book as a nickname, and it’s The Secrets of the Incredible–and it’s already been spotted out in the wild thanks to pre-orders! If you bought The Secrets of the Incredible and you like it, please leave me a review on Amazon or GoodReads or even Facebook! (It doesn’t matter where you bought it, reviews are universal.) Oh, and if your child reads it and wants to be featured in my kids’ reviews, message me! The book release party IS HAPPENING! If you’re in the neighborhood, join me at A Children’s Place Bookstore on Friday, August 3rd for a couple readings, refreshments (adult and otherwise), and maybe maybe (fingers and toes crossed!) a bit of circus fun. I’ll also be holding a small raffle to adopt (ok, “adopt”) an endangered aye-aye! (Why an aye-aye? What IS an aye-aye? Buy the book and find out!) Tickets will be $1; my goal is to raise $50. I’ll update the Facebook event as the details get ironed out. But in the meantime, I hope you’ll save the date!